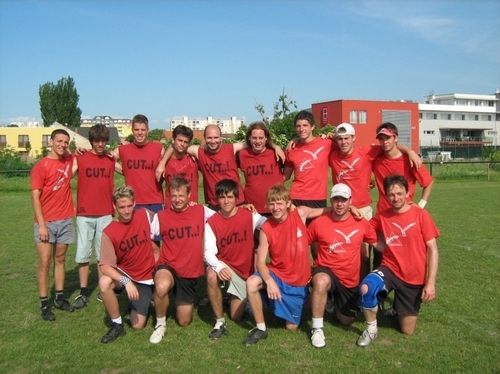 Since 2006, we have the European Ultimate Championship Series (EUCS) in Europe, in wich all the teams from Europe can compete, getting further and further through bigger and bigger tournaments in order to finally compete in the European Ultimate Championship Final (EUCF), and become European Champion. The EUCS runs in Open and Women division. The best 16 teams from the CEL countries, Germany and Denmark meet usually in Nurnberg, Germany at the end of August. The best 4 can go to…. This tournament was held in Florence - 2006 ; Basel - 2007 ; Paris - 2008. Together with our brother team, UFOzd, from eastern Hungary, we decided, that we should put together a strong Hungarian team, and show the Central European frisbee mates how the Hungarians play ultimate. So we did it, and went to CEL in Trnava, Slovakia, with big hopes, and unknown expectations. To cut the long story short, we played the final against Prague Devils, which was a great surprise for the Central European community, even for us, and probably the biggest result in Hungarian ultimate so far. On the way to the final, we have beaten teams like Mental Discorders from Bratislava, or the Upsadaisy based Dji Sam Soe from Vienna. A month later we hit the road again to compete in the CEL Final. After our glorious first round, being in the best 6th and qualifying for EUCR didn't seem so unreachable. We had a strong squad, and had some great plays, especially in the beginning of our games, but somehow in all of our games on the weekend, we had a mental breakdown after 4-4, or so, and this made us give the opponent at least a 4 score lead, which we couldn't work back at the end. So we finished 7th. Not a result as hoped, but it was a great experience for us, and a really nice start in EUCS, anyway. So Europe, better get ready for the Huns! We will be there next year, too! Upper line: Horváth Szilveszter "Szityó", Gerencsér Mátyás, Hegedűs Ákos, Boross Gábor, Lénárd Márton, Helt András, Berzi Bence, Oláh Sándor, Prán István "Petya"